A week after losing to the Cleveland Browns, the Cincinnati Bengals were tasked with taking down the undefeated New England Patriots in Week 5. The game was not enjoyable to watch and had a baseball score of 6-3 heading into the fourth quarter. Needing to separate themselves from the Patriots, the Bengals put together a 15-play, 93-yard, nearly eight minute drive, ultimately scoring a touchdown to go up two scores, 13-3. Andy Dalton and the Bengals offense started the drive at their own 7-yard line after a Patriots punt from midfield. 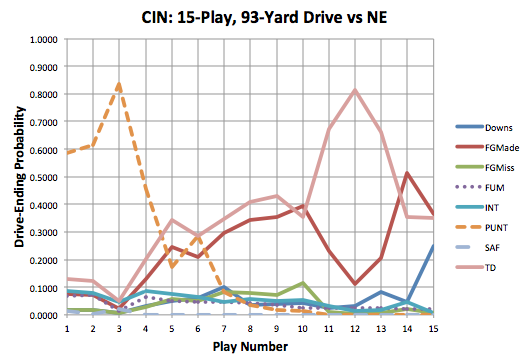 To start with, Cincinnati had nearly a 60% of punting and only a 13% chance of scoring a touchdown. Two plays later, after an eight-yard loss on a sack, Dalton was staring at an improbable conversion on 3rd-and-15 from his own two. At this point, that punting probability had jumped to almost 85% and the probability of a touchdown fell to just 5%. Dalton completed a 28-yard strike to Marvin Jones for 28 yards, cutting the punt probability in half. Giovanni Bernard followed suit with a 28-yard run, dropping the punt probability to under 20% and increasing the Bengals' chances of scoring to almost 70%. But the drive didn't end there. Dalton and company converted on two more third downs (plays 7 and 10), and ultimately faced a 4th-and-Goal from the 1-yard line. Marvin Lewis made the win-maximizing decision and decided to go for it. The Law Firm carried it across the goal line for a much needed score and the Bengals didn't look back as they went on to give the Patriots their first defeat of the year, 13-6. The Bengals don't have a win they'd have kept without one Giovanni Bernard. Kid is big time.